Needing a refresher? 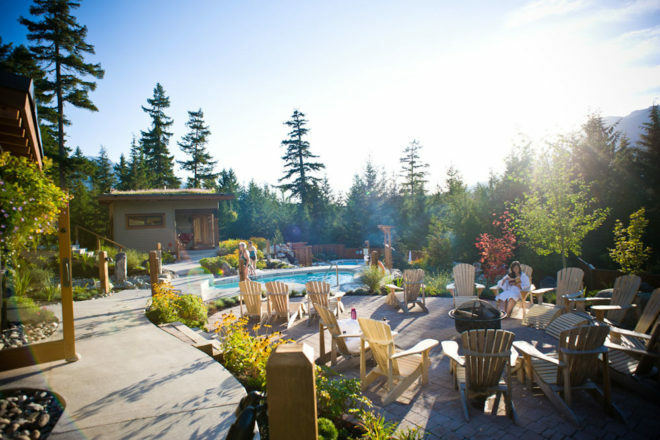 Scandinave Spa in Whistler is a totally decadent experience with hot and cold pools, saunas and steam rooms (photo: Chad Chomlack). Snowshoeing in Alberta is an easy way to escape into the bush and appreciate the Canadian winter (photo: Banff Lake Louise Tourism). 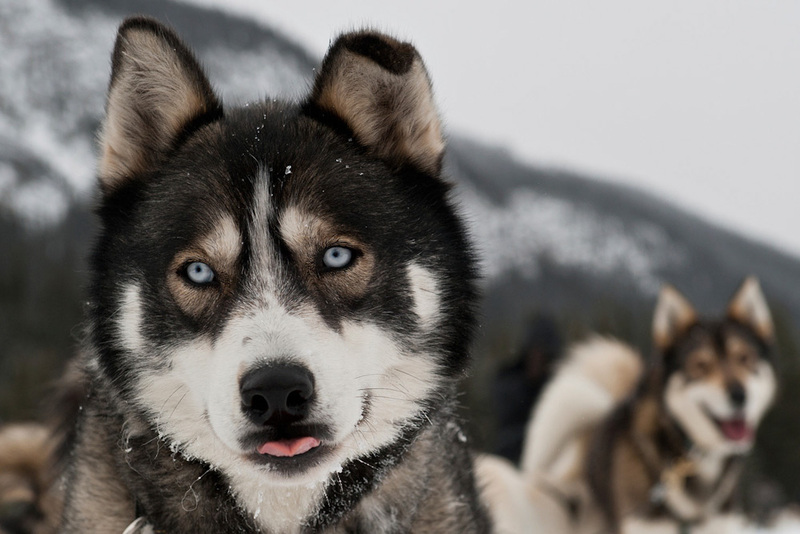 A very cute canine in Alberta, dog-sledding is a fun experience for both pooches and people. 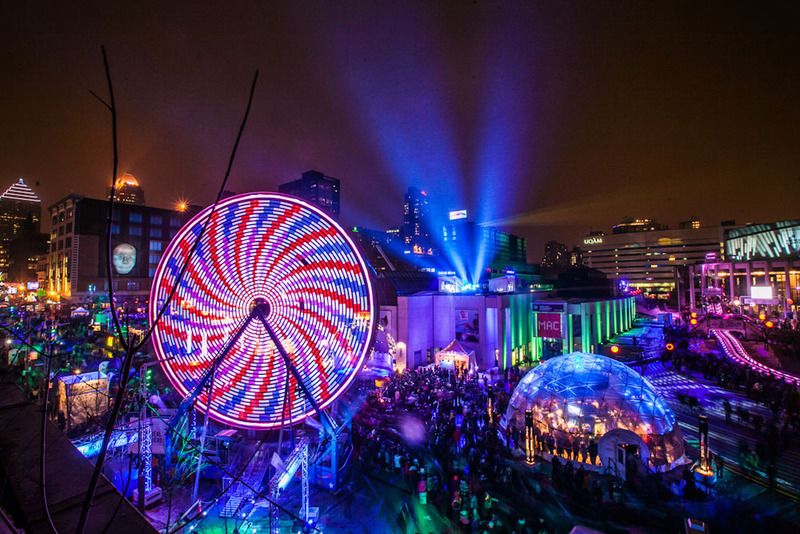 The city of Montreal comes alive at night during the Montreal en Lumière festival (photo: Quartier des Spectacles). Go at your own pace when you take a sled down the hill in Le Massif, stop for a hot chocolate halfway down (photo: Benjamin Gagnom). Ice skating in Nathan Phillips Square at night time in Toronto. 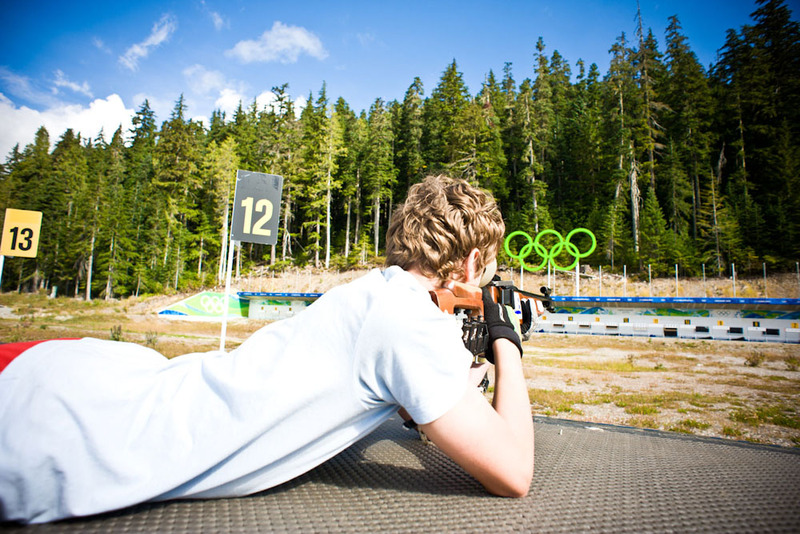 Rifle shooting is part of the fat-tyre biking and biathlon experience at Whistler's Olympic Park (photo: Tourism Whistler). Not everyone loves to schuss down the side of a mountain. Here are nine fun things to do during a Canadian winter for folks who like the outdoors but don’t want to ski. 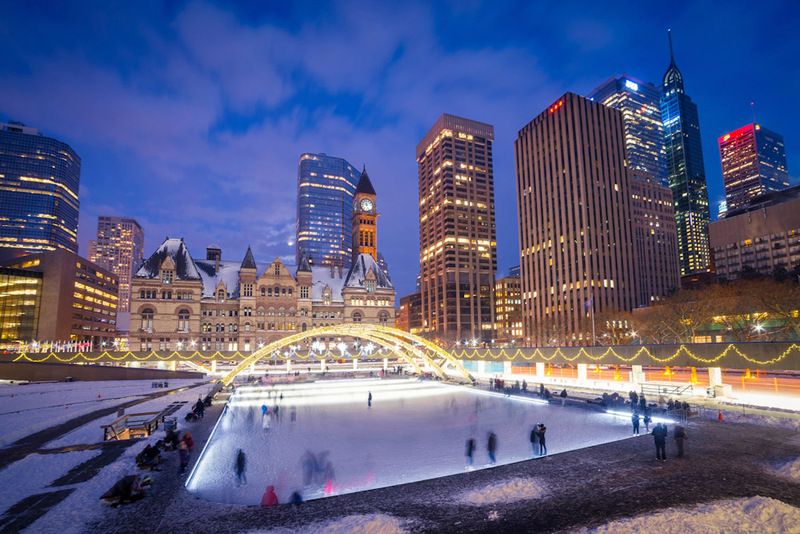 Toronto has one of Canada’s best-known outdoor rinks, a large affair that sits in front of the city’s iconic, twin-spired City Hall. You can bring your own skates or rent them from the kiosk. The rink is artificially frozen so you don’t have to worry about weather. New Year’s Eve is a wildly popular time to skate here, so arrive early if that’s your plan. 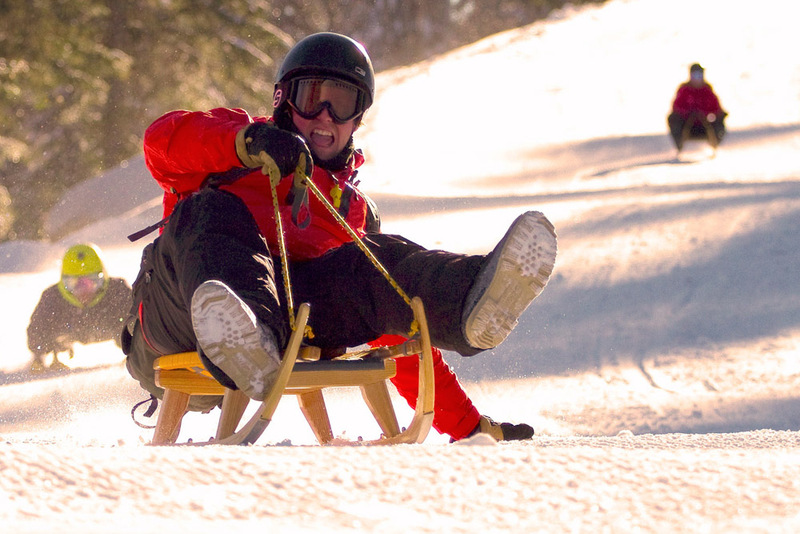 This is one of the most iconic winter activities you can undertake in Canada. The dogs love this as much as the people, barking and yelping as the sled owners get them ready for a mad dash. Sliding across a frozen lake under the icy-blue Alberta winter sky a few years ago was one of the most stunning experiences I’ve ever had in this country. Try Mad Dogs and Englishmen Expedition for a fun ride. This is an easy but thrilling experience that you can take at your own pace. Le Massif is a, well, massive (7.5-kilometre) downhill run west of Quebec City in the Charlevoix region. After a short lesson, you get to lie down on a sled and schuss your way down a series of winding trails, with the St. Lawrence River glittering in the distance below your feet. There’s a halfway point for hot chocolate or coffee. A truly fantastic experience. This is the most iconic winter festival in the world, with everything from kids’ rides to parades to outdoor sledding in one of the world’s most romantic cities. Try some frozen maple syrup on a stick or visit an old cabin to see what life was like in Canada back in the 1700s. Have your picture taken with the Carnaval mascot, the much-beloved Bonhomme (don’t forget to have a dance with him). The city’s restaurants and bars go wild during Carnaval. There’s also an ice palace you can tour or even spend the night in, made with enormous blocks of ice harvested in the area. Next year’s event runs January 29 to February 12. This is decadence beyond belief; a fantastic wellness centre with a series of warm, hot and cold pools in the outdoors, surrounded by snow-capped mountains and fragrant, deep-green trees. They also have a series of steam rooms (some with soothing eucalyptus to make Aussies feel at home) and saunas to warm your bones and send your troubles packing. When you’re finished, sip on locally produced Namasthé Tea in the woodsy Scandinave Cafe. This is a winter activity that’s easier than it looks, thanks to modern equipment and lightweight shoes made for Alberta’s light, fluffy snow. I did a hike a couple years ago near the Fairmont Chateau Lake Louise: a glorious couple of hours through waist-high powder in pristine conditions. Okay, minus-16 Celsius is a tad cold for some folks, but if you’ve got the right clothing, the exercise will warm you up in no time. A brilliant way to escape into the bush and appreciate the beauty of a Canadian winter. This is for the really, really hardy folks out there. I mean, anyone can surf at Bondi in January. But to head out into the waves at Lawrencetown Beach near Halifax in January when it’s zero Celsius or colder? Fat-tyre biking is catching on around the world, with special, heavy frame bikes and wide tyres with knobby treads that do well on packed snow. It’s a very strange – but enjoyable – feeling to pedal about on an upright bike in the snow. Small hills are a challenge, but downhill is a ton of fun. They have them for rent at the Whistler Olympic Park. They also have a program where you can pretend you’re an Olympic biathlete, taking part in cross-country skiing and then rifle shooting. The city of Montreal comes alive with light every winter, with hundreds of light fixtures all over the town. You’ll find marvellous concerts and exhibits from a city with joie de vivre to spare, as well as free outdoor events. Look for enormous puppets, as well as ziplines and fashion events. Need more non-ski holiday ideas?